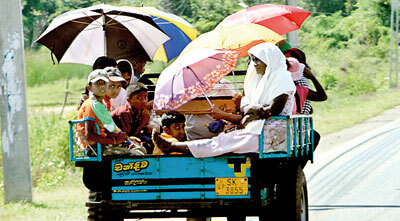 The almost unbearable heat signals a new trend of climatic change caused by global warming, experts say, with the Department of Meteorology forecasting the hot and humid weather conditions continuing until the second week of May.�Sri Lanka has never experienced such weather conditions in the past five to 10 years, the head of Colombo University Department of Geography, Professor S. A. Norbert, said. The Inter Tropical Convergence Zone (ITCZ) – a low-pressure zone encircling the equator where northeast and southeast trade winds come together – was causing a high intensity of solar radiation as it crossed Sri Lanka as “a broad belt between five degrees north and south” in March and April. “And with the sun’s overhead positioning over the country during the same period, hot temperatures can be experienced in all parts of the country,” Professor Norbert explained. �The country’s south-west would experience isolated night-time thunderstorms activated by the ITCZ’s low pressure centres. Thunderstorms could be expected in the afternoons in inland areas. “The thunderstorms would spread to coastal areas in the evenings,” Professor Norbert said. �Showers could be expected on the west coast in the mornings due to the development of clouds by inland breezes while warm conditions could be expected at night. Meteorological Department Duty Forecaster Merril Mendis, said heavy rains could be expected this week in inland areas, especially in the Central, Uva and Sabaragamuwa provinces, with a consequent slight decrease of the prevalent heat.�“Such conditions can be expected in the first inter-monsoonal period,” he said. The highest temperatures recorded last week were at Polonnaruwa and Trincomalee, 36.1 and 36.2 degrees respectively.